Description: This beautiful chest is the same design as Chest #1 that was an award winner at the International Design in Wood Exhibit and Competition in San Diego and published in a book called 500 Cabinets. 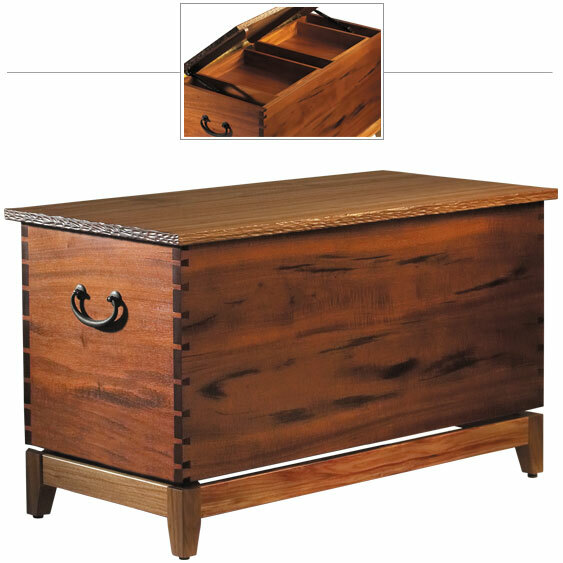 Different woods were used to construct this chest that lends a warm and rich appearance. The interior contains two suspended trays for keepsakes or photos. The lid is made from solid Canarywood with hand carved edges and fitted with gas cylinders to hold the lid open. The chest appears to be suspended from the beautiful Canarywood base. The craftsmanship is exceptional with beautiful and sturdy joinery, custom fitted trays and a satin smooth finish. This is a perfect piece for sweaters, blankets and keepsakes in a bedroom or used as a functional art piece in a family room or den.